Weird to see this in the newer etch! My first job back in 1994 had Sylvania 34w Whites! Cool! Very basic etch. Gotta love the older lamps before all the crazy symbols and trademarks came out. Cool! the MAZDA era here! Newer phosphors and better cathodes for longer life, but otherwise classic MAZDA lamps! Sweet lamp! Is that one I sent out with Aaron? Those are neat lamps! Yeah, never seen one like this either. Kinda rare since EPACT killed off basic halophosphate lamps like the CW, W, WW, D, etc. in F40T12 and F96T12 versions. 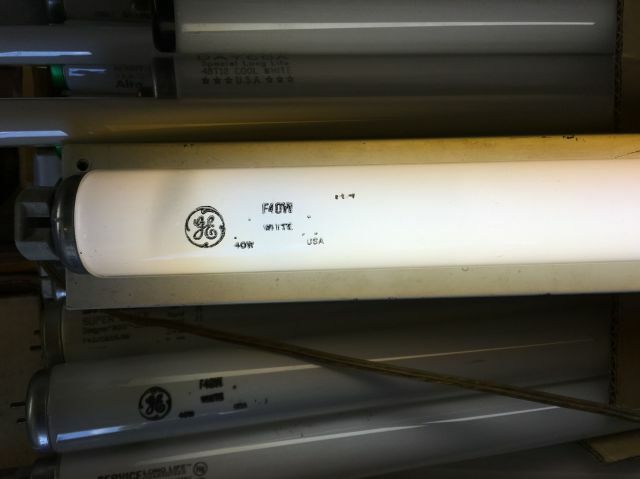 The GE F40CWs with the "meatball" etch are also kinda rare. I've never seen a F40WW or F40D with that etch, but I'm sure they're out there, albeit in small numbers. I'm mad at the EPACT. I don't think that much energy was saved from the standards, and we're left with more expensive lamps. I agree silverliner. Government ruins any thing they are involved with. I think the regulations had good intentions but they didn't work out in practice. The idea was to kill off T12 by getting rid of the common lamps but now people just use the deluxe colors. Even the lamp manufacturers found loopholes...CWX replacing CW, etc. Government had no business trying to kill off T12. Consumers preferred T12 when fluorescent was new. They both were available then. T8 slimline was even introduced before T12 was. People preferred T12, they took off and T8 was mainly used for specialty applications. In comes the government because people don't know what is best for them.